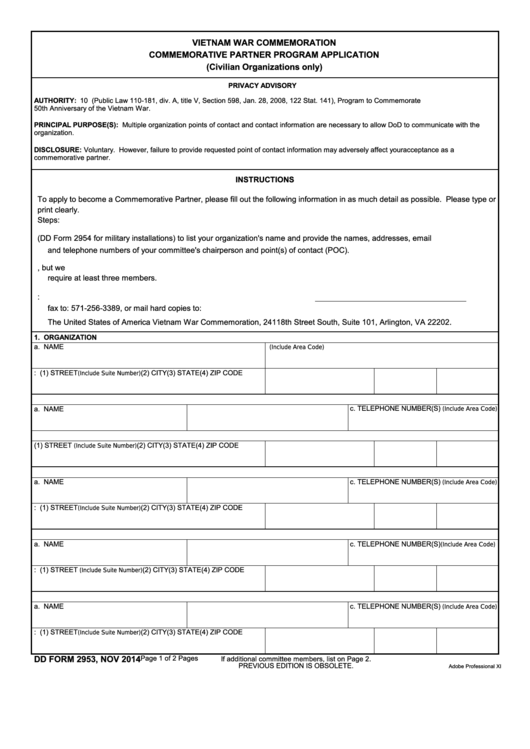 Download a blank fillable Dd Form 2953 - Vietnam War Commemoration Commemorative Partner Program Application in PDF format just by clicking the "DOWNLOAD PDF" button. Complete Dd Form 2953 - Vietnam War Commemoration Commemorative Partner Program Application with your personal data - all interactive fields are highlighted in places where you should type, access drop-down lists or select multiple-choice options. and telephone numbers of your committee's chairperson and point(s) of contact (POC). require at least three members. 3. Use the Submit button at the bottom of this form to email your application to: WHS.VNWAR50th_CPP_CIVAPP@mail.mil. The United States of America Vietnam War Commemoration, 241 18th Street South, Suite 101, Arlington, VA 22202. If additional committee members, list on Page 2.